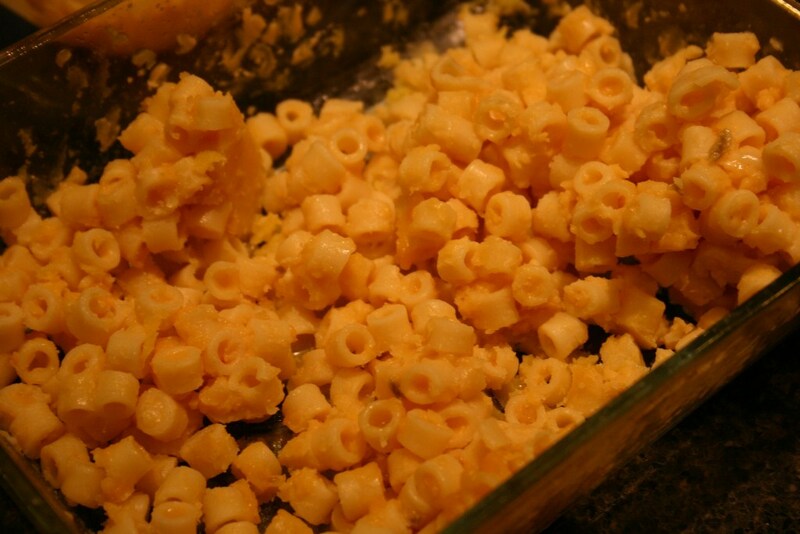 Exotic Mac and Cheese has been a trend for some years now. Yet I think that an excellent recipe that is close to the universal vision of the ordinary dish is something we all should have in our repertoire. I saw a promising recipe from avante-garde food creationists Aki Kamozawa and H. Alexander Talbott on Tasting Table - an interesting website / email newsletter (but please keep reading mine, too, OK?). They offered an innovative twist to make M&C - evaporated milk. But the original recipe was a little too rich for me - so I made a few minor modifications. I hope you try it. -- I recommend Barilla brand. Digitali (shown above) is a great shape for this dish. Cook pasta, but stop cooking at 75% of the recommended cooking time. Drain, and rinse in cold water to stop cooking. While pasta cooks, add butter, evaporated milk, salt and cayenne in a large saucepan. When the butter has melted add the cheddar and jack cheeses a little at a time. When incorporated into sauce, add pasta and cook over medium-low heat for 10 minutes. Butter a large baking dish. Add mac and cheese mixture. Sprinkle Parmesan and breadcrumbs evenly over top. Turn oven to low broil and place dish on middle rack. Cook until nicely browned. Friends - sorry that there has been a slowdown in my posts to y'all. I've had a vicious sinus infection for days, and even struggle to edit some of the prepared articles waiting for you. To keep your appetite in check, though, here's an easy favorite recipe from What Tom Cooked for you to consider. 1. Roast whole fresh turkey breast. Cut breast meat into strips. Of course a rotisserie chicken works well here too. 2. Ideally, get freshly made tortillas from your local tacqueria, if you live in the right place for that. Warm tortillas. 4. Toss mixed greens with olive oil, lemon juice, S & P.
5. 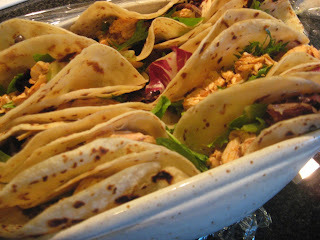 Fill tortillas with salad, then turkey. 6. Top taco with a dollop of plain yogurt. Not every experienced cook will agree with me, but I think that using good recipes is a foundational building block to becoming a better cook. With the exception of a few gifted and creative people, we are not all 'masters' of composing complex layers of flavor in a randomly created dish. Nor are most of us able to combine ingredients in innovative explosions of unexpected taste. I suggest that we take advantage of experts who already have created wonderful recipes and learn how to execute those recipes ourselves. Then, later, make the recipe your own, or use it's principles as a starting point for your own innovation. I believe in using a quite small collection of cookbooks, online sources, and magazines. While the short list of cookbooks changes over time, it's surprising how few cookbooks are in my rotation at any time. For a complete review of each book and it's pros and cons, visit this page on my What Tom Cooked website. I also recap some old favorites that once were in this top list of frequently used cookbooks. What Makes A Recipe or Cookbook High Quality? You like a lot of the recipes you've made from it. I'm not being flip about this, but really, you need to like what is produced. A high percentage of the recipes from the book / magazine turn out well. That also means that the level of the book is appropriate for your skill level. Most of the books I recommend are appropriate for near any level. Cook's Illustrated, How to Cook Everything and Jamie at Home are the three most basic on my list. The other three are a little more advanced, with the Gourmet cookbook containing quite a few advanced recipes (along with many, many approachable ones too). There are few or no errors in the recipes. You would think that cookbooks don't have errors because all the recipes are so well tested in advance. I wish that were true. There are mistakes that get published. Of course I'd expect the instructions to be clear and easy to follow - that kind of goes with out saying. Are time appropriate - a big time investment gives a big payoff. Quick recipes need to be powerful and effective. Rarely utilize packaged, canned, jarred, dried commercial / convenience food items. Use specialty ingredients judiciously to full effect. Rely on fundamentals, not gimmicks, tricks, shortcuts. Change with the times; are not reflective of just the latest fad item, tool or flavor. I think there are shockingly few good cookbooks - and fewer (maybe only one) good magazine - that provide truly high quality recipes. But don't take these words as a dictate that only old, proven sources are reliable. We all need to keep trying new things - products, techniques, recipes - then rely on the ones that prove themselves worthy. Leverage the expertise of great cook and chefs who can translate their skills to home cooks. Gadgets, poor quality cookware, dull knives make cooking slower, less predictable (reliable), slower, less safe and less fun. Poor ingredients will never allow a dish to reach it's fullest potential - and possibly will be disastrous (really - inedible, food poisoning, not worth the effort....the reasons go on and on). Developing solid fundamental techniques make cooking faster, more enjoyable, allow recipes to be executed properly and lay the foundation for your own interpretation, improvisation and creativity. Better cooking results in GREAT FLAVORS, multiple dimensions of taste and a memorable eating or entertaining experience. Good, fresh cooking is always rewarded, but great cooking is revered and savored. I'll limit this first little taste of my ideas to the highest level concepts. Instead of running on and on breaking these concepts down into detail, I'll share them in a series of additional articles. Questions / comments? Email me at tmcguff@gmail.com or leave comments on www.beabettercook.net. How Long Does It Take to Make A 30 Minute Meal? This is another favorite column that originally appeared in Be A Better Cook last year. I'm providing some repeats for the new group of subscribers who began reading this blog recently. This week we’ll explore a cooking show that sets a very precise expectation. Rachel Ray’s 30 Minute Meals comes close to delivering on it’s promise – if you add a few more minutes. You’ve got to be pretty jaded if Rachel Ray’s enthusiasm doesn’t infect you. OK – I watched a few extra episodes this week – she’ll get on your nerves after a while. Yet her 30 Minute Meals show is one of the most genuine depictions of cooking you can find on TV. She really does cook her two or three course meals in 30 minutes actual time while taping her shows. She is carrying out a very precise plan – from the recipe itself, to the order in which she preps and cooks every component of the meal. By not improvising, and following her recipe, she doesn’t introduce any guesswork, testing, problem solving or needed “repairs” into her cooking. Note: the first time you make something from a recipe, you’ll spend some extra time reading and re-reading the instructions. But if the recipe is good and you make it several times again, you’ll cut that overhead down to almost nothing. The initial time investment is worth it if you’re using a good recipe. Have you noticed how Rachel makes one or two monster trips through her kitchen from fridge to pantry to prep area, loading her arms up with ingredients? All her final serving dishes, as well as needed pots/pans are out in advance on the counter and stove. I do this for big parties, but it saves time for an everyday meal too. She follows the French concept of mise en place – essentially “things in their place”. Her raw ingredients are in front of her or to her right, then she preps / opens / cuts in the center of her work area and all her scraps and leftovers are placed to her left. She uses a “scrap bowl” in front of her work area for all peelings, packaging and whatever trash she generates. No trips to the sink or trash can. I use a plastic bag from vegetables so I can throw it away directly and have one less bowl to clean up. Rachel’s been coking seriously for decades and is expert with her knife skills. She can peel and dice a vegetable or trim meat, or separate chicken parts far faster than the average cook. Like all cooking shows, there are some real world aspects missing. It’s these things that allow Rachel to prepare that meal in 30 minutes but it will take us an hour. She does well, but many other cooking shows are far less realistic. They rarely prep all the ingredients during the show, they pre-cook portions of the meal and generally just summarize the cooking process. Most of us are not expert level…..We wash, peel and chop slower than Rachel. By the way, have you also noticed that all her vegetables are pre-washed? So even a little rinsing time is not part of her 30 minute window, giving her another edge over our actual cooking time. You can improve your prep skills by cooking fresh ingredients frequently and using sharp knives. You also improve by learning and focusing on the fastest and best ways to prepare an ingredient. You can pick that up from Rachel quite readily. Interruptions….Rachel never has to deal with phone calls, homework questions, letting the dog out, breaking up skirmishes among the children and opening a bottle of wine for the cook. I don’t make too many recipes from Rachel’s show or books, in part because I think there are many higher quality recipes out there for everyday cooking. But, I’ve found a few I like. Almost all her recipes are straightforward, uncomplicated and use very fresh ingredients. So I respect her approach and her recipes a great deal. Just count on spending almost an hour for her 30 Minute Meals. 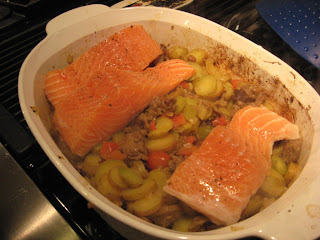 In the next post I share one of my favorite dishes from Rachel, One Pot Sausage, Potatoes and Fish. This is an example of a recipe that I first thought would be “just ok”, but actually has some real magic in it. I hope you like it as much as my family does. This recipe seemed unusual to me at first. The combination of sausage, potato and fish didn’t seem quite natural. Then I thought of my favorite gumbo which starts with sausage and finishes with seafood, so I gave this a try. I didn’t expect much from this recipe because there are literally no herbs and spices in this dish, just S&P. Boy was I wrong. Despite the simplicity of the seasoning, this dish develops rich, multi layered flavorings from the vegetables, with the starch from the potatoes combining with white wine to create the simple sauce. Not only that, everyone in my family (from age 6 on up) liked this immediately and wanted me to make it again soon. Cut fish in to 4-5 pieces, approximately 1" thick at the center. Use a large, covered pot, such as a Dutch oven or a ceramic baking dish that can be used on a stovetop. Over medium high heat, brown the sausage until cooked through, breaking it into small pieces, about 4 minutes. Add a little olive oil if needed to keep from sticking. Add onion, garlic, potatoes and half of the white wine. Add salt and pepper to taste. Cover and cook for 10 minutes. Stir tomatoes into the potato mixture. Place fish fillets atop the potatoes. Season with Kosher salt and fresh ground pepper, then add the remaining white wine. Cover and cook for 6-8 minutes, 4-5 minutes if fish is less than 1" thick. Drizzle lemon juice and a small amount of olive oil over top of fish.